Introduction: What is Variant Prioritization? Since the advent of rapid and cheap whole genome sequencing technologies, we have amassed a large and diverse collection of human genomes. Interpreting this large amount of data is still challenging, and one such challenge is understanding the function of single nucleotide variations (SNVs). These often arise in individual genomes compared to reference sets which also include many single nucleotide polymorphisms (SNPs). Specifically, identifying pathogenic or deleterious mutations compared to common harmless mutations is a key challenge. Often, deleterious mutations are nonsynonymous, meaning that they result in the change of one amino acid to another. The average individual has over 10 million SNPs in the whole genome, about 20,000 of which are in the exome, or the protein-coding portion of the genome. Of course, not all of these are deleterious - the number of potentially deleterious mutations in the exome often amounts to about several hundred (1)(2). This problem of identifying relevant disease-causing mutations or variants compared to common mutations is called variant prioritization. Here, we aim to prioritize variants in the exome of SubjectZ. SubjectZ has 22,981 exome SNVs of which 1,800 are rare SNVs (4). Furthermore, of these rare SNVs, 1,018 were found to be nonsynonymous. 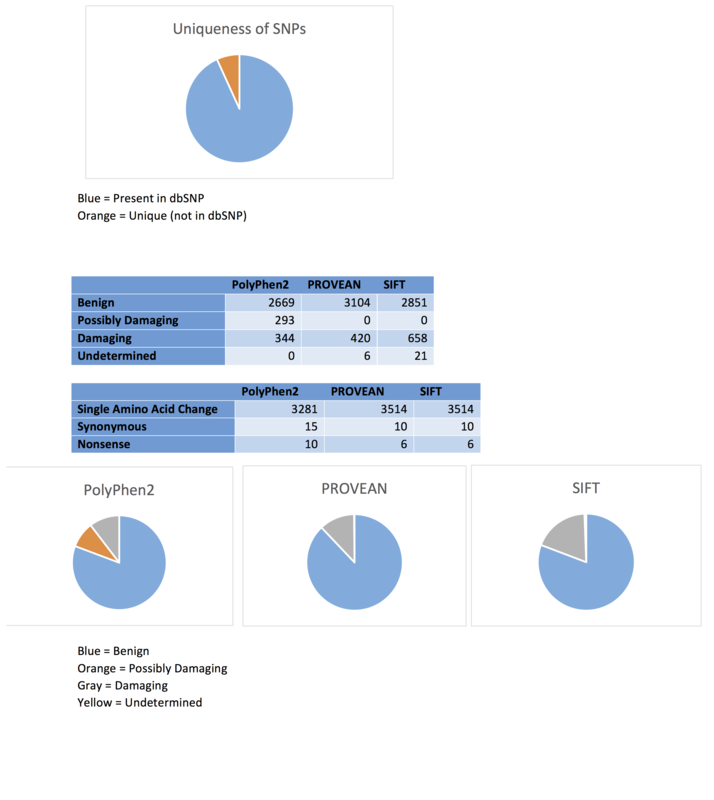 Both a de novo approach and existing tools such as SIFT, PolyPhen, and Provean will be used to perform variant prioritization. The methodology used to prioritize SNVs in the de novo tool will be explained and compared to those used in other approaches. The results of our tool and those from the mentioned tools are detailed in the Pipeline and Coding sections of this text. The output of an alignment of one individual’s genome to a reference is often a Variant Call Format file. This file contains not only information about mutations in the nucleotide sequence compared to the reference, but also important metadata regarding the quality of the alignment, and other important properties that can allow for further sub-classification (3). In our analysis, we have a paired down VCF text file containing the following information. Perhaps the only non-self explanatory field is the GERP score which “measures evolutionary conservation of genetic sequence across species” (5). A higher score means that the nucleotide sequence is more conserved and variation is rarer and potentially more adverse. All of this information is parsed for prioritization. Ideally, variant prioritization employs several orthogonal pieces of data to effectively classify SNVs. I will discuss some commonly used parameters in variant prioritization and their significance. Obviously, the nucleotide sequence information is used, namely to assess any mutations in amino acid. Synonymous mutations as mentioned are often harmless as they result in the same amino acid at the position. However, codon frequency can sometimes cause problems if the new codon does not have enough corresponding charged tRNAs for effective protein synthesis. Nonsynonymous mutations become more harmful as the amino acid substituted is more divergent in size and charge. Considering the conservation and position of SNVs is also important. Mutations in the hydrophobic core are often rarer, as these regions tend to be more well-conserved. A common hypothesis is that mutating conserved regions has a greater risk of deleteriousness. The reason rare SNVs are more likely to be deleterious is because other similar mutations have been eradicated from the population due to intolerance – probably because the mutation was in a well-conserved region and caused protein expression to fail in some way. Using structure prediction software such as TMHMM and Phyre2 to see whether the mutated amino acid is in a conserved internal secondary structure, active site, or membrane could give further insight into the effect size of the mutation (7). This does not exclude common variants from the search as there are many examples of more common variants that influence well-known diseases such as breast cancer. The GERP score can be used to evaluate conservation in the case of SubjectZ. Looking at the amino acid level, a BLOSUM matrix accounting for the high degree of similarity between reference and subjectZ can be used to evaluate conservation. Existing information about the mutation can be accessed such as any existing information regarding the SNVs involvement in characterized diseases. This phenotypic information can be mined using the position of the SNV and/or the provided protein sequences. For example, finding the BRCA SNV alone (which occurs in about 3% of the population on average) may not have given it as high a priority as other rare SNVs, but armed with existing information about its critical role in breast cancer would lead to higher prioritization. Gene Ontology terms are good starting points for this type of information as well as SWISS-PROT entries. Considering whether the SNV was previously identified in the 1000 Genome project or in the dsSNPs database and checking these entries might provide further insights into the disease model of the mutation. All humans have two alleles of a given gene. Most often, only when both alleles are mutated (i.e. when the individual is homozygous for the mutation) does the disease phenotype arise. In some cases haploinsufficiency may arise, when the individual does have one functioning copy but it is not producing enough gene product for normal function. Checking whether the SNV identified is in only one or both alleles can help prioritize the mutation. Lastly, any co-varying mutations will not be caught by standard SNV ranking pipelines - only monogenic variants can be identified. Ideally, gene information, variant information such as GERP scores, and phenotype information if any can be compiled and used with machine learning for optimal results (6)(7). For more detailed documentation of Nir’s tool and common variant prioritization tools, see the Coding and Pipeline sections. Both SIFT and PROVEAN only take into account sequence information when calculating variant deleteriousness. PolyPhen2 is a much more advanced and nuanced tool, looking at sequence, structure, and existing functional information to make its prediction (8). It also resulted in no “undetermined” SNVs. Interestingly, although there were no synonymous SNVs in the input file, all open-source tools predicted a handful, possibly because the reference genomes the tools compare to are different from the one in the input file. Nir’s tool does not look at existing functional information, but it does try to incorporate some amount of structural information by looking at size via molecular weight. Adding in a TMHMM search to rank membrane bound residues would probably help acheive better predictions. As an advantage, Nir’s tool considers both conservation at the amino acid level and the nucleotide level through the BLOSUM score and GERP score respectively. 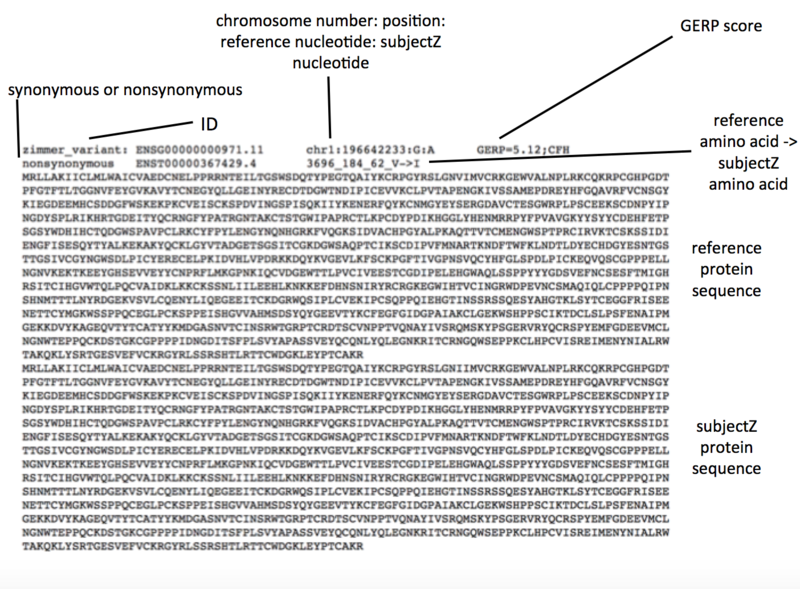 Gerstein lab data shows that SubjectZ has 824 rare nonsynonymous coding variants (4). Given that we started from a file of about 3500 nonsynonymous SNVs and SubjectZ is supposed to contain over 10,000 nonsynonymous SNVs, it is unclear how our results (described below) compare to this data (4). “What are single nucleotide polymorphisms (SNPs)? - Genetics Home Reference.” U.S. National Library of Medicine. National Institutes of Health, n.d. Web. 09 May 2017. “IGSR: The International Genome Sample Resource.” VCF (Variant Call Format) version 4.0 1000 Genomes. N.p., n.d. Web. 09 May 2017.
Cooper, Gregory M., Eric A. Stone, George Asimenos, Eric D. Green, Serafim Batzoglou, and Arend Sidow. “Distribution and intensity of constraint in mammalian genomic sequence.” Genome Research. Cold Spring Harbor Lab, 01 Jan. 1970. Web. 09 May 2017. Ng, Pauline C., and Steven Henikoff. “Predicting the Effects of Amino Acid Substitutions on Protein Function.” Annual Review of Genomics and Human Genetics 7.1 (2006): 61-80. Web. “Overview.” Overview[PolyPhen-2 Wiki]. N.p., 10 Mar. 2017. Web. 09 May 2017. Below is an overview of the Variant Prioritization Tool constructed by Nir. The first step is to parse the SNV file for SubjectZ that was provided. Next, simply by reading the the file, one can classify each SNV as either synonymous or nonsynonymous. This file only contains nonsynonymous mutations, so this step is skipped. If synonymous mutations did exist, the frequency of occurance of the new codon can be calculated and scored. Next the amino acid mutation must be characterized as either missense or nonsense. If it is a nonsense mutation, the algorithm compares the length of SubjectZ’s protein to that of the reference, classifying a larger difference in length as more deleterious. In the case of missense mutations, four parameters whose weights the user can decide are calculated. The size of the protein substitution is accounted for by calculating the difference in molecular weights, again with larger differences prioritized higher. The amino acid and nucleotide conservation scores are included through the BLOSUM and GERP scores for each substitution. Finally, a charge score, checking if the amino acid has changed properties or remained the same (neutral, hydrophobic, or hydrophillic) is included. Each of these four scores is added together with the user specified weights, generating a rank ordered list of SubjectZ’s SNVs. 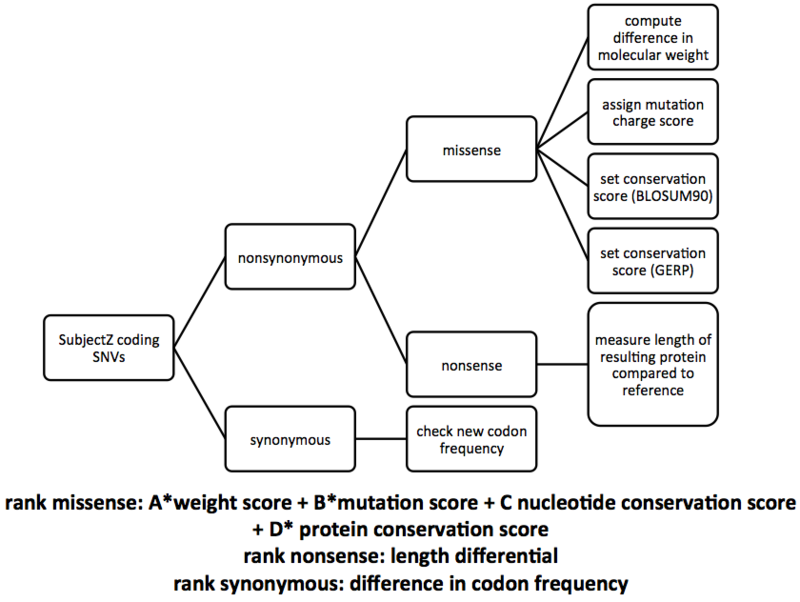 The weights for each property of the missense mutation are left to the user because there is no consensus on what property is most important for determining deleteriousness. Several parameter combinations can be attempted and all results compared. The ability to predict harmful protein coding mutants is becoming increasingly important in both the clinical and the research setting, and as a result there have been many algorithms developed that predict whether a particular nucleotide change is harmful or not. Adzhubei I, Jordan DM, Sunyaev SR. Predicting Functional Effect of Human Missense Mutations Using PolyPhen-2. Current protocols in human genetics / editorial board, Jonathan L Haines . [et al]. 2013;0 7:Unit7.20. doi:10.1002/0471142905.hg0720s76.